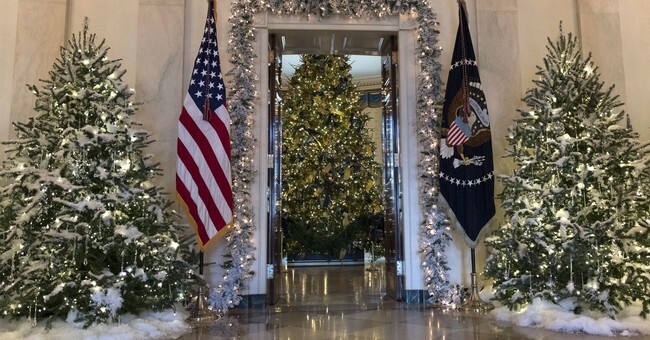 President Trump has followed through on his promise to say Merry Christmas again instead of the politically correct Happy Holidays greeting. The official White House Christmas card for the 2017 holiday season reads, "Merry Christmas and a Happy New Year," and is signed by President Trump, first lady Melania, and their 11-year-old son, Barron. Trump repeatedly vowed to say Merry Christmas again on the campaign trail, and even brought up the issue again last month at the Values Voter Summit. “We’re getting near that beautiful Christmas season that people don’t talk about anymore. They don’t use the word Christmas because it’s not politically correct," he said to heavy applause from the audience. The Obamas on the other hand always sent out a Happy Holidays or Seasons Greetings card. “As our family reflects on our many happy years spent in the White House, we are grateful for the friends we’ve made, the joy we’ve shared, and the gifts of kindness we’ve received. We wish you and your loved ones a joyous holiday season and a wonderful new year,” their card from last year read.